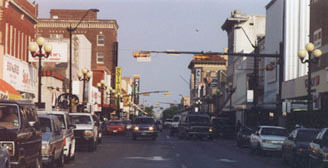 This page was originally published in 2000, after several photos from Brownsville were submitted. At that time, highway signage in the city was quite a mess. This page pointed out all of the errors, and provided specific details about how each assembly should be changed. 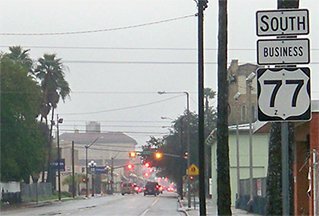 At some point prior to 2008, nearly every erroneous sign in town was replaced to match exactly what was suggested on this page. 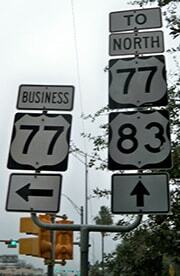 That assembly has since been removed; Washington is now signed as "Business 77" only. 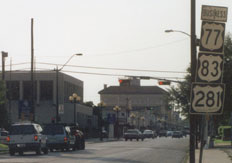 The building in the distance is on Palm Blvd, which is the city's "zero" street. Washington is discontinuous at that point, so traffic is routed over to Elizabeth (one block to the left), where that street begins to serve both directions. 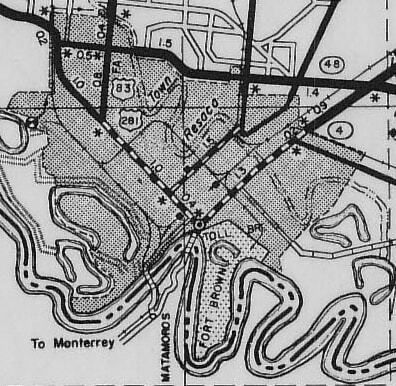 It should be noted that the early TXDoT map indicates that the US 83 designation ended at Central and Elizabeth, and that it was only US 281 that continued to Gateway. 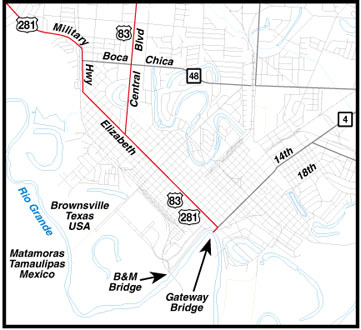 However, that seems unlikely, since US 83 had been signed all the way to the border before the US 281 designation was extended into Brownsville. 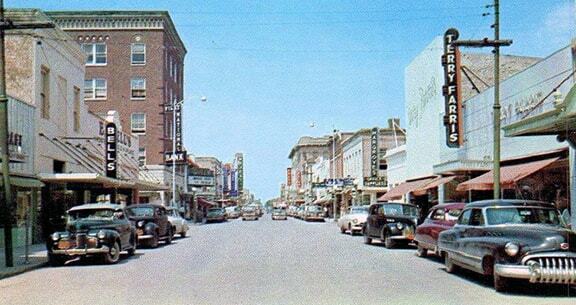 Elizabeth is the next block, so that was the perspective of a driver at the south end of US 77-83. 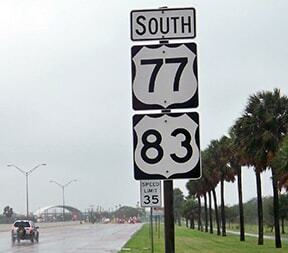 That was also the perspective of someone at the "east" end of US 281... or at least the "signed" end of US 281. 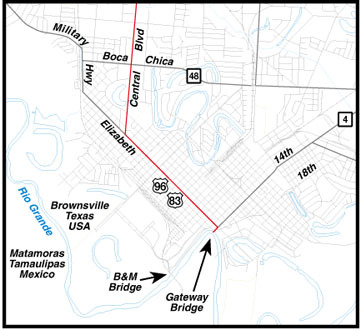 At some point Boca Chica Boulevard was extended west (across Military Hwy and the railroad) and it became the new alignment for US 281. 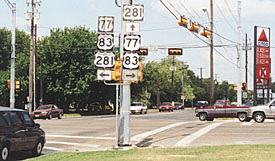 When this happened, the US 281 designation was apparently truncated to the intersection with Central. Or more accurately: while TXDoT may have officially truncated the route on paper, it appears the district DoT office never got around to taking down the signs. 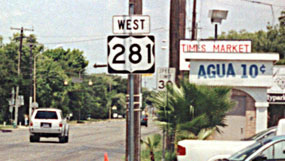 It is possible that many of the US 281 signs that were still posted in the early 2000s were supposed to have been removed fifty years prior to that. Part of the reasoning behind this theory is that many of the 281 signs on the historic part of the route use an apparently older, slightly odd-shaped shield (as can be seen in some of the photos on this page). 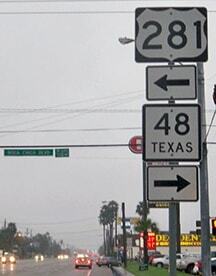 Also shown there is the corrected signage at the east end of US 281. 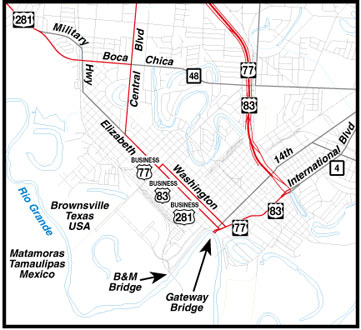 According to TXDoT literature, the business loop is officially "Business US Highway 77". 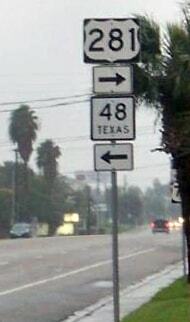 According to TXDoT minute orders, there is no "Business US 83" here. 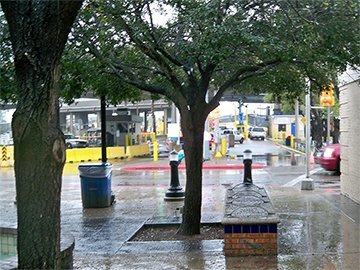 But that is where apparently there was a pretty radical departure from what the central DoT office decided and what the district DoT office actually did. 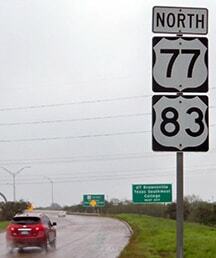 For one thing, it appears that -- instead of adding "BUSINESS" tabs above US 77 shields -- in many cases the district DoT made a non-standard decision to simply add the word "BUSINESS" directly onto the existing US 77 shields. 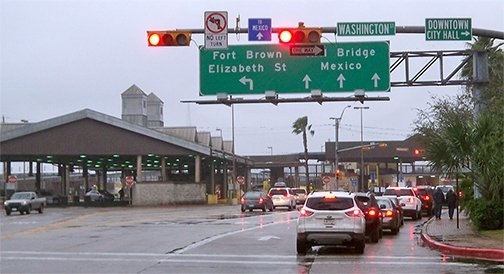 And worse: instead of taking down the US 83 and US 281 shields along Central and Elizabeth, they added the word "BUSINESS" to those signs as well. 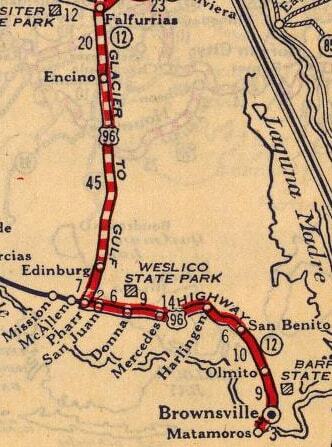 So the map above reflects signage that was actually posted in the field, not the TXDoT official route designations. The notion of "Business 83" worked fine, even if it was not official. 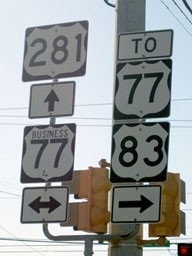 But the "Business 281" signs were a problem. 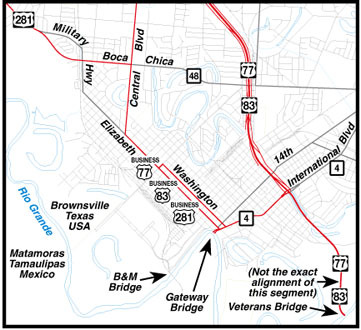 When US 77-83 was rerouted, the US 281 designation should have either been a.) 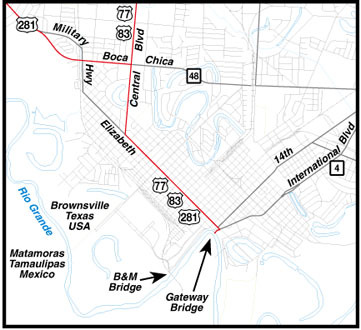 extended east along Boca Chica to the new US 77-83, or b.) extended down Central and Elizabeth to the Gateway Bridge. But apparently TXDoT did neither, nor did they check to see that the district office re-signed the routes correctly. last updated Dec. 14, 2017.